The ECM monitors the switching frequency ratio of air fuel ratio (A/F) sensor 1 and heated oxygen sensor 2. A three way catalyst (manifold) with high oxygen storage capacity will indicate a low switching frequency of heated oxygen sensor 2. As oxygen storage capacity decreases, the heated oxygen sensor 2 switching frequency will increase. When the frequency ratio of air fuel ratio (A/F) sensor 1 and heated oxygen sensor 2 approaches a specified limit value, the three way catalyst (manifold) malfunction is diagnosed. Three way catalyst (manifold) does not operate properly. Three way catalyst (manifold) does not have enough oxygen storage capacity. Do not hold engine speed for more than the specified minutes below. Check that вЂњCOOLANT TEMP/SвЂќ indicates more than 70В°C (158В°F). Select вЂњDTC & SRT CONFIRMATIONвЂќ then вЂњSRT WORK SUPPORTвЂќ mode of вЂњENGINEвЂќ using CONSULT. Rev engine up to 2,000 to 3,000 rpm and hold it for 3 consecutive minutes then release the accelerator pedal completely. Check the indication of вЂњCATALYSTвЂќ. Which is displayed on CONSULT screen? CMPLT>> GO TO 5. INCMP >> GO TO 3. Wait 5 seconds at idle. Rev engine up to 2,000 to 3,000 rpm and maintain it until вЂњINCMPвЂќ of вЂњCATALYSTвЂќ changes to вЂњCMPLTвЂќ (It will take approximately 5 minutes). Does the indication change to вЂњCMPLTвЂќ? YES >> GO TO 5. Stop engine and cool it down to less than 70В°C (158В°F). Is 1st trip DTC detected? YES >> Proceed to EC-285, "Diagnosis Procedure". Perform component function check. Refer to EC-284, "Component Function Check". Use component function check to check the overall function of the three way catalyst (manifold). During this check, a 1st trip DTC might not be confirmed. NO >> Proceed to EC-285, "Diagnosis Procedure". Restart engine and keep the engine speed between 3,500 and 4,000 rpm for at least 1 minute under no load. Visually check exhaust tubes and muffler for dent. Listen for an exhaust gas leak before the three way catalyst (manifold). Is intake air leak detected? YES >> Repair or replace error-detected parts. Check the fuel injector. Refer to EC-450, "Component Function Check". NO >> Perform EC-450, "Diagnosis Procedure". 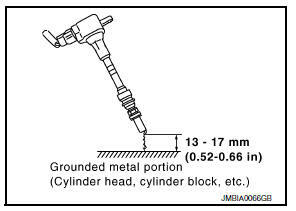 Check the initial spark plug for fouling, etc. Refer to EM-13, "Inspection". NO >> 1. Repair or clean spark plug. Refer to EM-45, "Removal and Installation". Remove fuel injector assembly. Refer to EM-40, "Removal and Installation". Reconnect all fuel injector harness connectors disconnected. Does fuel drip from fuel injector? YES >> GO TO 11. NO >> Replace the fuel injector(s) from which fuel is dripping. Refer to EM-40, "Removal and Installation". NO >> Replace three way catalyst assembly. Refer to EX-5, "Exploded View".